Houstonians spend more time in their cars than their homes and perhaps then understandably spend more money on their car loan repayments than their mortgages! Houston sprawls for over 600 miles and is connected by a spaghetti of freeways and highways. Two million people live in America's fourth biggest city that grew from wilderness to a booming economic centre. Only New York is home to more Fortune 500 company headquarters. In 1901, a year after displaced Texans from coastal Galveston moved inland to Houston following a deadly hurricane, oil was discovered at the Spindletop oil field near Beaumont. Much money was then invested in the ship canals and later into the formation of the Port of Houston, now the largest in foreign imports in the US, which includes nearly all European cars sold in t his country. In 1950 Texans found air conditioning, something that if it were to disappear tomorrow, then so would Houston. With air conditioning came an impetus for companies and employees to migrate from the cold manufacturing 'Rust Belt' states such as Ohio, Michigan and Indiana to the warm south. The energy sector grew and the space industry began with NASA's space centre being established in 1961. Now known as the Lyndon B. Johnson Space Center, the huge complex situated southeast of the city is also the base for the Mission Control Center that coordinates and monitors all human spaceflight for the United States. In 1961 to commerate Houston's new space age the Astrodome opened, which was the first ever roofed stadium in the world. Sadly locals now call it the 'Lonely Dome' as it is rarely now used. There is talk of it being turned into a hotel as preservationists fight against calls for it to be demolished. The Houston Astro's baseball team now play at Minute Maid Park, or the 'Juice Box' as fans call the 41,000-capacity stadium with a retractable roof which we saw wide open as we drove by on Friday evening as they entertained the Rockies. Minute Maid Park is actually wired for wi-fi, can you image how that would change blogging on the Addicks? The countries 4th biggest city is well served by sports teams, sorry franchises. The Houston Texans are the NFL team, you may remember the Houston Oilers like I do, well they decamped to Tennessee in 1997, changing their name to the Titans. The beauty of franchises eh? The very good Rockets are the basketball team with the amazing 7ft 6in Yao Ming and the Houston Dynamo's are the MLS soccer team and the defending champions incredibly winning the MLS Cup in both seasons since their formation. They average 18,000 playing at Robertson Stadium within the University of Houston campus. Houston's sprawling landscape has mainly been allowed to happen because of the lack of zoning regulations. Therefore multiple districts have grown in different parts of the city, and with public transport being restricted to the odd bus (I saw one all weekend) and a light rail line that runs for 8 miles from the University of Houston to the business district Downtown, which is kind of an anomaly as there is more than one business district, SUV is king helping make Houston one of the most polluted cities in the US. Downtown however has the largest assemblage of prominent companies and buildings including the JPMorgan Chase Tower, the 36th tallest building in the world (above). Many of the buildings are connected by an extensive network of pedestrian tunnels and skywalks, air-conditioned of course! We didn't spend a lot of time exploring the main districts, spending the majority of the weekend in the car, do what the locals do, see? Trouble with that is that I never really got a good feel of the place because you just don't see anyone. On Sunday we drove out to Old Town Spring, half an hour north of Houston, which was a step back in time to a charming old Texas town known for it's antique shops. 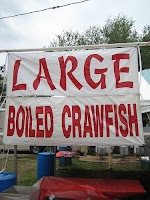 The place was packed with people travelling into Old Town Spring to witness the annual Texas Crawfish Festival. 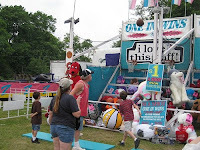 Live music, fried food, fairground rides and rodeo was what people were here for and of course crawfish. I'm not sure if you've ever eaten crawfish but they are shrimp-like creatures boiled and seasoned but a bugger to shell, messy and not exactly filling once you've swallowed one! There cert ainly were some sights to behold at the Texas Crawfish Festival, the crawfish were certainly not the only crustaceans boiling in the midday sun. As I said in the car on the way back to civilisation, I'm reasonably well-travelled but I will never cease to be startled by the way some people live their lifes in parts of this vast country. 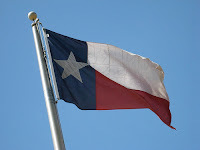 On Saturday we drove out to Montgomery, a tiny place (pop: 489) but the birthplace of the Lone Star Flag. We made a short stop for a malt shake in Huntsville and bizarrely watched a rugby match for a while before carrying on to Lake Conroe for lunch. 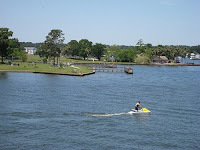 It's a pretty lake, man made and running through the Piney Wood Forest about 60 miles from Houston. 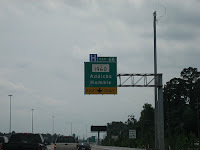 This area is a booming suburb and I'd imagine in a city known for it's grisly traffic, this part of the I45 Freeway is a busy road during the week but at least you have to pleasure to drive past the aptly named Addicks Humble (below). Conversely the River Oaks neighbourhood is very walkable. A stroll around some of the residential streets will remind you, in case you'd forgotten, where all of that money goes after you've filled the car up. Ex-Enron chief Jeffrey Skilling was a resident of River Oaks, one of the wealthiest zip codes in the USA, but he now lives in a Minnesota prison. River Oaks Country Club was hosting an ATP tournament the weekend we were there, and my mate blagged his way in amongst the stetsons. There is lots of window shopping here and some of the cities best restaurants. We went to Mark's on Sunday night, and although my tuna was a bit overcooked, although a good deal tastier than a crawfish, the service and the 1920's renovated church in which the restaurant is set was fabulous.